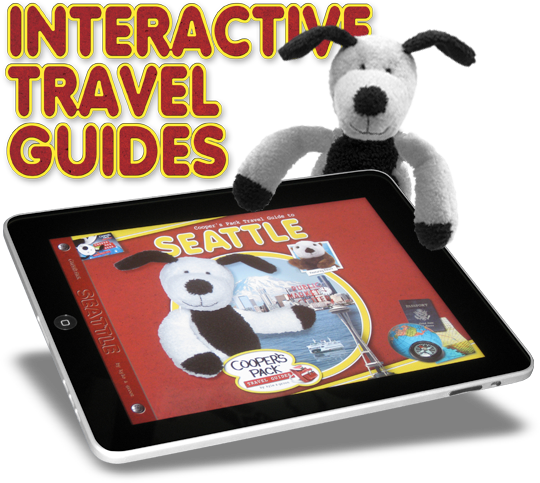 To supplement the print versions of our Cooper’s Pack Children’s Travel Guides, we’re pleased to present our Apple iPad apps featuring your favorite traveling stuffed dog Cooper and his friends. Each app includes the print-based story along with over 100 “buried bones” you can hunt for. Once you find a buried bone, click on it and learn more about the story, fact, or feature. The Fun Facts sections include additional imagery and information based on the site within the city. 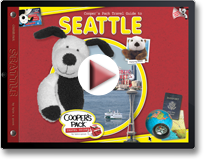 Watch Demo showing Cooper’s Pack Seattle Kids Travel Guide with your favorite traveling stuffed animal, Cooper and his old friend, Elliott the Otter. The video includes features, buried bones and animations. The Cooper’s Pack Seattle eBook is available for the iPad and can be purchased on iTunes. Check back soon for additional releases (coming soon!). Contact Cooper today to purchase your guides.